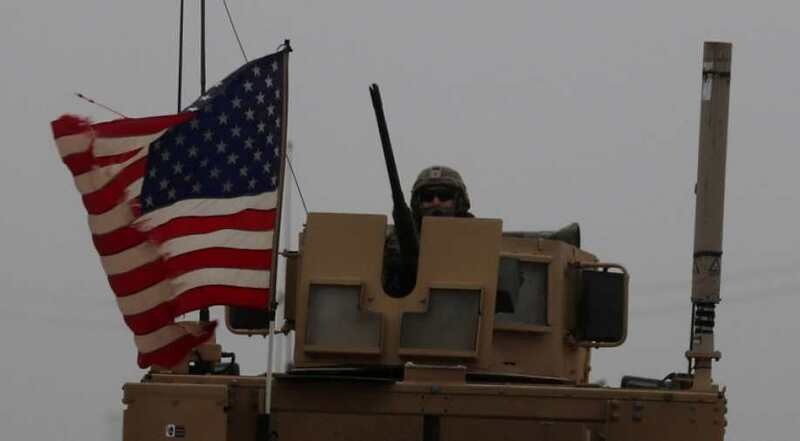 The Stars and Stripes fluttered above four US armoured vehicles driving through drizzle in the Syrian city of Manbij Sunday, each visibly carrying an armed soldier on lookout duty. The US patrol inside the strategic city near the Turkish border comes despite President Donald Trump's shock announcement this month that he is pulling American troops out of the war-torn country. Almost eight years into Syria's civil war, a Kurdish-led alliance called the Syrian Democratic Forces (SDF) controls a large swathe of territory in the country's northeast, including Manbij. The unexpected US pullout announcement left Syria's Kurds scrambling to find a new ally in the Damascus regime, as they feared losing US support would leave them exposed to a long-threatened Turkish assault. But inside Manbij on Sunday, American troops did not appear to have left yet, an AFP correspondent said, and residents were relieved to have spotted at least two US patrols. "The Americans' presence is reassuring for people, as the situation has become tense since we heard about their decision to withdraw," said Mohammed Ahmad, a 28-year-old shop owner. On Sunday, men and women milled between stalls at a nearby vegetable market, wearing coats to keep out the rain. A woman clutched a toddler on her hip, while another appeared to be carrying a baby swaddled in a thick blanket. "The presence of the US-led coalition is a strength for Manbij," Ahmad said. But US troops "departing would leave it weak in front of Turkey" and Ankara's proxies. "If they do pull out, the (Syrian) regime's return to the city would be better" than pro-Turkish rebels, added the young man, whose shop sells warm socks and other winter accessories. In a war that has killed more than 360,000 people, the Damascus regime -- long on the back foot -- has wrested back control of almost two-thirds of the country since Moscow intervened in its favour in 2015. Damascus now has its eye on regaining oil-rich areas held by the SDF. Trump has said he will pull all 2,000 troops from Syria, declaring that Washington had achieved its objective of victory over the Islamic State group. The jihadists have lost nearly all their territory, although thousands of its fighters are thought to remain in Syria. The SDF has been a key player in the US-led coalition against IS, but Ankara considers its leading faction -- the Kurdish People's Protection Units (YPG) -- to be "terrorists". A YPG spokesman on Sunday said US troops remained in their bases. "The pullout has not started," Nuri Mahmud told AFP. Since Friday, Syrian troops have deployed in a crescent in a bid to prevent Kurdish territory around Manbij from falling to Turkish troops and pro-Ankara rebels massing to the northwest. On Sunday, these troops stood guard in the countryside near the Arab-majority city, supervised by regime ally Russia, a source on the ground said. At the closest point, regime forces were stationed less than 500 metres from pro-Turkey opposition fighters, the source said. Ankara says the YPG is a "terrorist offshoot" of the outlawed Kurdistan Workers' Party (PKK) that has waged an insurgency against the Turkish state since 1984. Alongside backing rebels that oppose Damascus, Turkey has led two previous incursions into Syria, with the latest ousting Kurdish fighters from the northwestern enclave of Afrin in March. On Saturday, another AFP correspondent saw pro-Turkish rebels parade in camouflaged rain ponchos some 70 kilometres (45 miles) west of Manbij. Rebel commander Yussef Abu Mamduh told AFP his forces were ready to attack Manbij. "We finished the preparations to begin operations to free the city of Manbij from the control of the PKK," he said, alluding to the Kurdish-led SDF. "The fighters that will carry out this operation are ready to enter the city of Manbij and the whole area east of the Euphrates" River, he said, referring to SDF-held areas. "We will pool all our forces, weapons and ammunition in order to achieve victory and freedom for the people in those areas," he added.